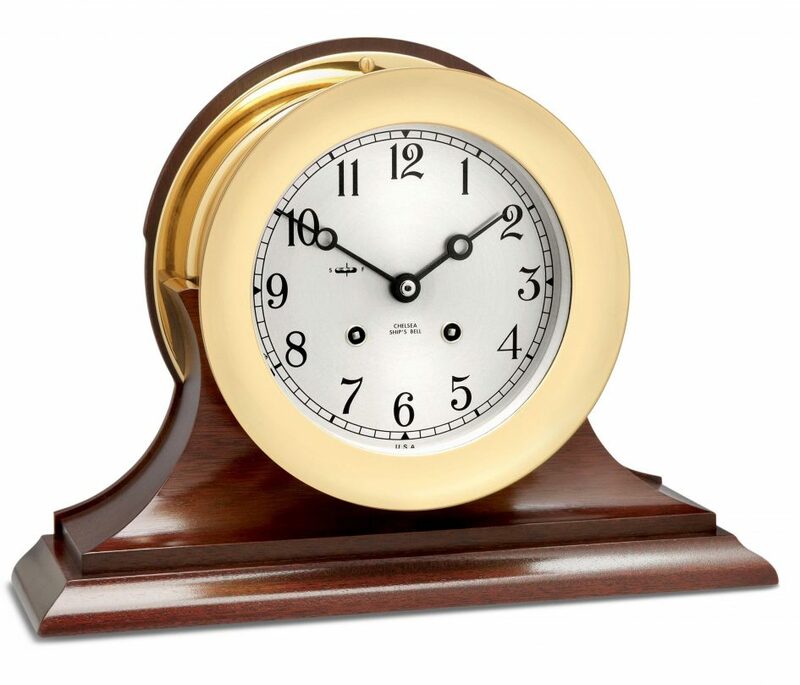 Each Ship’s Bell clock is made and assembled by hand at our factory in Chelsea, Massachusetts. It takes up to four weeks to craft each timepiece, which is made with over seven pounds of solid brass and more than 364 precision parts – including gears, pins, plates, and screws – as well as our patented 11-jewel movement. All of our Ship’s Bell clocks mark the hours not only by their handsome, hand-silvered dials, but by rich, mellow chimes – the same way they have since these timepieces were first introduced in 1900. Mariners have used a unique bell code to tell time at sea for hundreds of years. The code is based on the crew’s typical workday routine while the vessel is under way. A ship at sea requires constant attention throughout the day’s twenty-four hours. Therefore, the day is divided into six, four-hour periods, each called a “watch.” Similarly, the crew is broken up into three divisions. Division members stand their individually assigned duties on two watches per day, with eight hours off duty between watches. To rotate each division’s watch times, the Evening Watch is periodically divided into two watches. These are called Dog Watches because they “dog” the watch schedule for all divisions ahead by one watch period. The watch officer struck the ship’s bell every half hour to apprise the crew of the time. A single bell denoted the end of the first half hour, and one bell was added each half-hour. Eight bells therefore signaled the end of each four-hour watch. Chelsea Clock Ship’s Bell clocks have – and always will – follow this same sequence. So, like centuries of seafarers, Chelsea Ship’s Bell clock owners know the time even when they can’t see it – by its signature chimes! I have six Chelsea clocks! I grew up there so I really love them. One clock goes a little fast. Which way should I turn the little wheel on the middle left of the face? Left or right? Chelsea will never be forgotten here in Northeastern Pennsylvania ! If the clock is running slow, you’ll want to move the wheel towards ‘F’ for Faster. I’m not sure whether that’s to the left or right on the face of your clock. My clock only rings either one or two rings. Can I fix/ adjust this on my own. I have a manual wind Boston labeled Chelsea ship’s watch bulkhead clock I can provide a serial number upon request to verify its age. I’ve read through all of the FAQs & found only a couple that are similar but not the exact same problem I’m having. Top of the hour strikes correctly, even numbers 2-8. The bottom of the hour however isn’t just off by one or more but is completely out of sequence but consistent. I checked the strike hammer for alignment it’s in the middle of the rod & gap is about 1mm at rest from the rod. The hammer strikes the rod every time without stopping short. 1600 is 8, 1630 is 7, 1700 is 2, 1730 is 1, 1800 is 4, 1830 is 3, 1900 is 6, 1930 is 5. Any ideas on this one? I’m baffled. I recently inherited my brother’s ship’s clock (I think it was made in the late 70s) and I love it. It looks very much like the clock face in the photo. It keeps good time and the bells ring in the correct sequence. But I recall that my brother was able to silence the bells when needed (like avoiding disturbing the sleep of houseguests who are not used to the sound) but I can’t see anything that would enable me to do that. I tried just not winding them but for whatever reason, that seemed to cause the usually-reliable clock to stop. There is a fast/slow adjustment on the face but no other things except the two holes for winding. And believe me, I have looked. If the clock is a Ship’s Bell Clock, open the front cover look closely at the number 8 at 8 o’clock. To the left of that number is a small lever that moves in a slot. if you move the lever to the bottom of the slot, away from the bell image, the clock will be silenced. do the different sizes of ship’s bell clock have different sounding bells? Do two clocks of the same size differ appreciably in sound?